In college, I had a classmate whose family lived in Hyderabad. Her father worked in the Southern Railways and every time she returned to college after the holidays, she would bring a huge tin full of chocolate fudge squares. What impressed me most was her telling me that it was something she could close her eyes and make. That's how simple it was. A while ago, I had to make fudge for a friend. I trawled through several recipes wondering how on earth some people found it such an easy thing to make. I finally found a recipe that seemed easy. It needed cans of condensed milk and chocolate. I made a test batch which turned out quite well but surely there was another way of doing it? Today was fudge trial day for me. I dredged up an old recipe, the ingredients were all at hand- a bit of chocolate, some milk, sugar, butter, salt and vanilla essence. The milk had to be heated with the chocolate and stirred till completely smooth, then sugar and salt added and stirred on a low flame till completely melted and the mixture came to a boil. Well, the sugar refused to dissolve even though I had used fine grained crystals. I carried on with the recipe and finally poured it into the tin to set, knowing fully well that it would have to be binned. Attempt No. 2 and this time, I decided that I would be be unconventional and dissolve the sugar in the milk. 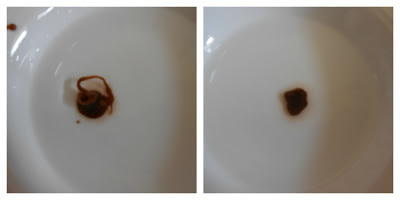 The chocolate was melted in the microwave, then mixed into the hot milk. I got a smooth mix and with the candy thermometer clamped on the side of the pan, the mix soon started boiling. After 10 minutes, I started testing the consistency by putting drops of it into a bowl of cold water. It took another 10 minutes to reach the soft ball stage that is required for fudge. If you can form the the chocolate drop into a ball, it has reached the soft ball stage. With the thermometer reading 236°F, the pan was removed from the flame and butter and vanilla essence added. The fudge should not be stirred as the melting butter forms a layer over over the top and prevents a crust from forming. From then on, it was all quite simple. Wait for the temperature to read 110°F, then use either an electric beater or sheer muscle power and a wooden spoon to beat it. With an electric beater, a few whips should be sufficient. When you see the colour changing to a lighter shade of brown, stop and scoop it all into a grease proof paper or foil lined pan and press it down as firm as you can. And that's it. Allow it to cool, slice into 1" squares. Place milk and sugar in a saucepan, bring to a boil, turn down the heat to the lowest setting and stir till sugar dissolves completely. Melt chocolate over a double boiler or in a microwave, mix to a smooth paste. Pour some of the milk syrup into the chocolate and mix well. Keep adding more liquid till it is a smooth paste. Pour it into the rest of the liquid, add the salt and place the pan back on the fire. Clamp a sugar thermometer onto the pan and when the mix boils, reduce the heat to the lowest and do not stir. Cook till it reaches 236°F. Remove the pan from the heat immediately, add the butter and vanilla essence. Do not stir. When it cools to 110°F, (it should reach this temperature in 20 minutes or so) beat with a beater or a wooden spoon till quite thick. Do not overbeat or it will turn grainy. Pour into a lined tin (mine was 7.5"x 3.5"). Pess down to compact it, level the surface. Cool to room temperature then cut into 21 squares.